We had a package of 15 bean soup mix in our Angel Food order this month. When I’ve bought such things before it was the expected mix of pintos, white beans, split peas, lentils, kidney beans, etc., but when I see “mix” on the package, I expect, you know…seasonings and instructions. But no. It was basically a bag of mixed beans and nothing else. So I got to improvise. 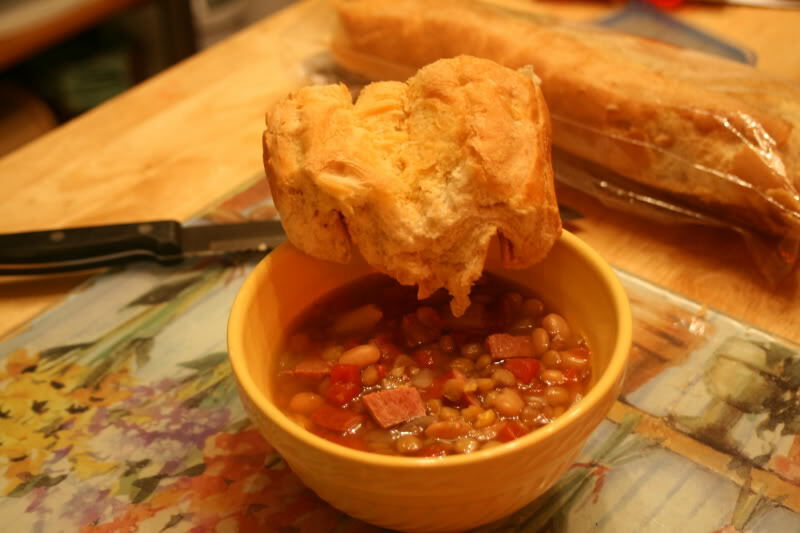 I figure smoked sausage always goes well with beans, so I used that as a base and came up with the following, which I thought would make for a decent first entry for Souper Sundays, hosted by Kahakai Kitchen. Well I didn’t strictly follow the quick soak method on the bag. I did boil the beans for 1-2 minutes, but I only soaked them for about 20 minutes before draining them and adding them to my crock pot. You can totally put them in dry, but soaking them first reduces the more, um, gaseous side effects. While the beans are soaking, dice the turkey sausage and onion, and mince the garlic. Add to crock pot. Add in the can of tomatoes. Add enough water to cover the beans (within an inch or so of the top of a 6 quart cooker). Add the creole seasoning and some fresh ground pepper (I eyeballed the pepper but it was maybe 1/2 a tsp). Cook on low for seven-eight hours. I tried this without salt at all, but I found that it just didn’t taste quite right. So you’ll want to add salt to taste either upon serving or during the last little bit of cooking. This works out to 6 servings at 426 calories and 8.75 grams of fat. I love bean soup and the smoked turkey sausage sounds wonderful. Thanks for coming to Souper Sundays this week. I just got the round-up posted. Your recipe sounds really good. And our recipes are similar. To shorten the cooking time, I soak the beans overnight in the refrigerater and cook on the stove, 2-3 hours in a large,heavy soup pot. And any good smoked link sausage works! For starters,I simmer the diced onion and minced garlic in several T. extra virgin olive oil for 3-4 minutes,just to soften..then add the other ingredients ,using a can of Rotelle instead of tomatoes..and a T. of chili powder. I also use Cavanders “salt free” Original Greek Seasoning..it is such a great mix of spices and herbs… and add a few shakes of black pepper. No additional seasoning packet or salt needed! You can’t go wrong with 15 bean soup. I’ve started adding more beans to my diet and the pounds are coming off.